Nathaniel Gould, universally known as Nat Gould, was born on 21 December 1857 at 27 York Street in Cheetham, a suburb of Manchester. Nat Gould was to spend most of his early life in that city, where his father, Nathaniel Gould 1824-1874 was a tea merchant. The family had only recently become settled in Manchester, however, at the time of Nat's birth. His parents were country people. His father was a younger son of an old yeoman family, the Goulds of Pilsbury Grange near Hartington in Derbyshire. His mother, née Mary Wright, was also born and bred in the country. This pastoral inheritance was important to Nat Gould throughout his life, and he wrote eloquently and longingly of his ancestral home. After leaving school, his first employment was, not unnaturally, in the tea trade. Later he went farming at Pilsbury Grange and still later farming in Bradbourne. 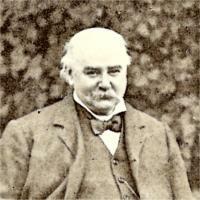 Having no hope of a farm of his own, he returned to the Manchester tea trade in 1876, taking up a job at Auty and Firth. Then he moved to Nottinghamshire and became a journalist at Newark. After a few years during which he worked hard and learned the trade, he began to experience discontent at Newark. In 1884 he emigrated to Australia, where he worked on various newspapers successively in Brisbane, Sydney, Bathurst and then back in Sydney. During his second spell in Sydney he wrote his first books, and continued his career as an author after his return to England in 1895, and settling down with his family to life at Bedfont in Middlesex. During his relatively short life of just over sixty-one years Nat Gould wrote and published over one hundred and thirty novels and stories. He died at Bedfont in 1919.